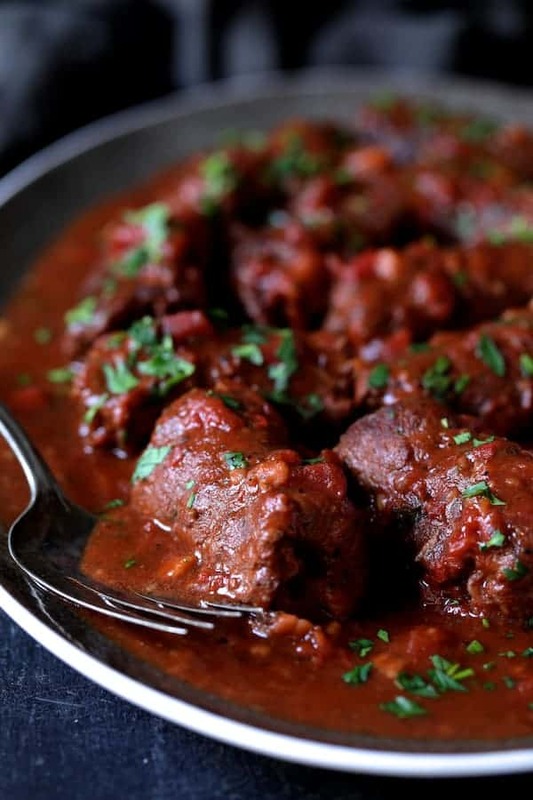 Beef Braciole is a company-worthy, classic, hearty, homestyle southern Italian dish that’s perfect for a winter night! Thin slices of beef, a savory filling in a wine-infused sauce you’ll fall in love with! Beef Braciole (pronounced BRA-cheeo-lay) has many variations. It can be made with thin, individual slices of beef such as round or as one large roll using flank steak. It always has a savory filling. 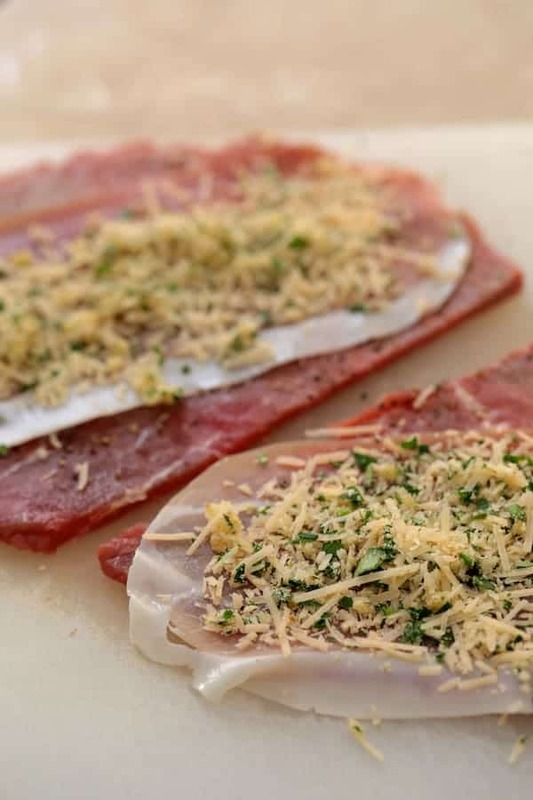 The filling for beef braciole may be any number of things including cheese, breadcrumbs, fresh herbs, preserved meats such as prosciutto or salami. Another combination may be spinach, pine nuts and raisins. 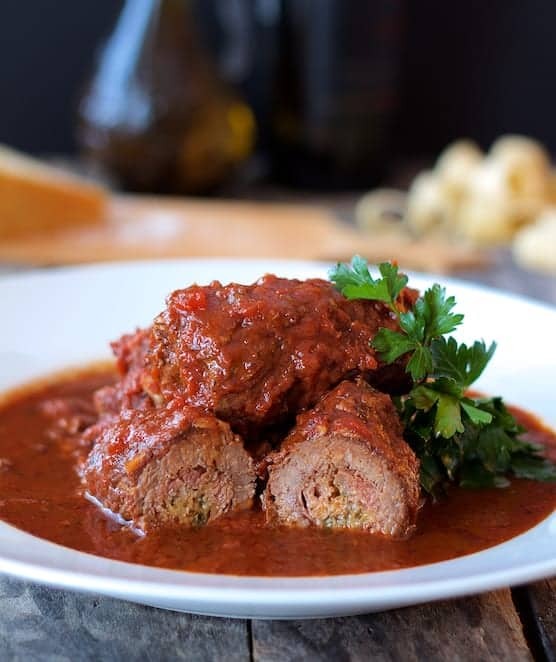 No matter what you fill it with, Beef Braciole is a hearty, Italian home-style dish you will fall in love with! 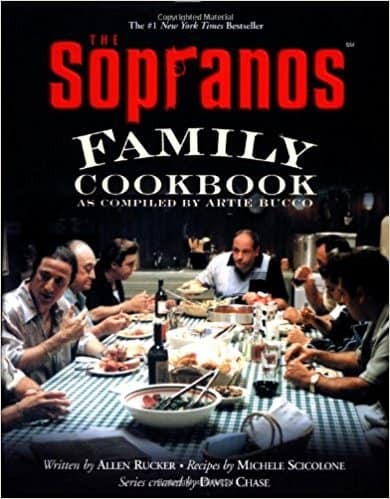 I adapted this Beef Braciole recipe from one in the “The Sopranos Family Cookbook.” (Affiliate link.) A client, who was a fan of the show, requested I prepare that recipe. A couple of tweaks later, it’s been a favorite on my personal chef menu ever since. For this version, you’ll need thinly sliced beef top round, which you can get your butcher to do. Slices of top round can be quite large. First, I pound it out to tenderize it, then cut in half widthwise to make it the perfect size to accommodate a slice of prosciutto. Prosciutto is a dry-cured Italian ham. Prosciutto di Parma is imported from the Emilia-Romagna region of Italy and can be quite expensive. Less expensive domestic brands are available in most supermarket deli departments. Tuck the sides in to secure the filling, roll into a cylinder and secure with a toothpick. Brown in olive oil to a lovely deep brown then braise in the wine-infused sauce for a company-worthy dish! If cooking Beef Braciole on the stovetop, you may not need the flour to thicken the sauce as it’s going to reduce as it simmers. I prefer the oven or slow-cooker method because those cooking methods don’t require much attention. Serve the Beef Braciole over thick, tube-shaped pasta such as ziti, penne or rigatoni and some good crusty bread! Beef Braciole is a hearty, slowly-simmered wine-infused homestyle southern Italian dish that’s perfect for a wintry night. Cut top round slices in half widthwise so that you have 12 equal pieces. Place beef between two pieces of plastic wrap. Gently pound to 1/4 to 1/8-inch thickness. Mince 4 cloves of garlic; slice the remaining 8 cloves. Combine minced garlic, parsley, cheese, breadcrumbs, salt and black pepper in a small bowl. Place a prosciutto slice over the filling then sprinkle filling evenly over all beef slices. Roll the beef into a cylinder, tucking in the sides to hold in the filling as you roll. Secure with toothpicks. Heat olive oil in a Dutch oven or large pot over medium-high heat. Place the beef rolls, seam side down in the pot and brown seam side first to seal it. Cook, turning the meat occasionally until each roll is nicely browned on all sides. Transfer to a plate. Add the wine and the sliced garlic. Bring to a boil, scraping up any browned bits. Add beef broth, tomatoes and Italian seasoning. Place beef rolls back in the pot and bring back to a simmer. Cover and cook on low heat, turning occasionally until beef is tender and easily pierced with a fork, about 1 1/2 hours. Alternately, cook covered in a 325-degree oven for 1 1/2-2 hours or in a slow cooker for 3-4 hours on high, 5-6 hours on medium or 7-8 hours on low. To thicken, place pot back on the stove if cooked in the oven. Remove some of the hot cooking liquid to a bowl. Add the flour and stir until smooth to create a slurry. Slowly add it to the hot cooking liquid, bring to a slow simmer and cook until thickened. Season with salt and black pepper to taste. Remove toothpicks and serve over pasta with additional grated cheese if desired. If cooking on the stovetop, you may not need the flour to chicken the sauce because of how the sauce will reduce. I love the way meals come out in my crock pot. Can I cook the meat rolls in there with the sauce? I’m making this for a fun gathering of friends and am very excited! It looks and sounds wonderful. Hi, Jerri, Thanks so much for your question. You absolutely can! I’m a huge slow-cooker fan for things like this and think they’d come out great, too. Thanks again and hope you and your friends enjoy! Can you freeze leftover brachiole? Hi, Patricia, You absolutely can! Just cool it down thoroughly and place in a good, airtight container. Should be fine for about three months. Thanks for your question! Hi Carol! I’m dying to try this recipe– I live where there aren’t many Italian restaurants and have never seen this on a menu. I am VERY confused about the top round, though. I’m supposed to ask a butcher to slice a cut of beef that is only 3/4″ to 1″ thick to start with, into six horizontal pieces? Is that even physically possible or have I mis-read the instructions? And then I divide it to make 12 pieces and then further pound it to fit the size of the prosciutto? I just want to make sure I have my facts straight before I go to the butcher and make a fool of myself 🙂 Thanks! Kroger slices it horizontally into thin 1/4-inch thick slices that are perhaps 6 inches wide and 10 inches long. You would then need to cut those in half widthwise to get a piece that’s approximately 3 x 5 which is closer to the size of a piece of prosciutto. The Fresh Market near me does not have the meat for this recipe because they don’t have a slicer and as far as I know, Whole Foods doesn’t either. Hope that clears things up and hope you enjoy! How long would you cook it if using a crock pot? Hi, Ren’ee, Thanks so much for your great question! I would do three to four hours on high or six to eight hours on low. The pieces are small they might not take the full four hours or the full eight hours. Thanks again and hope you enjoy! Question for you– I am hosting a bookclub dinner very first week in Dec. 2018, for 10 women. – I’ve been obsessing over what to serve– ugh! 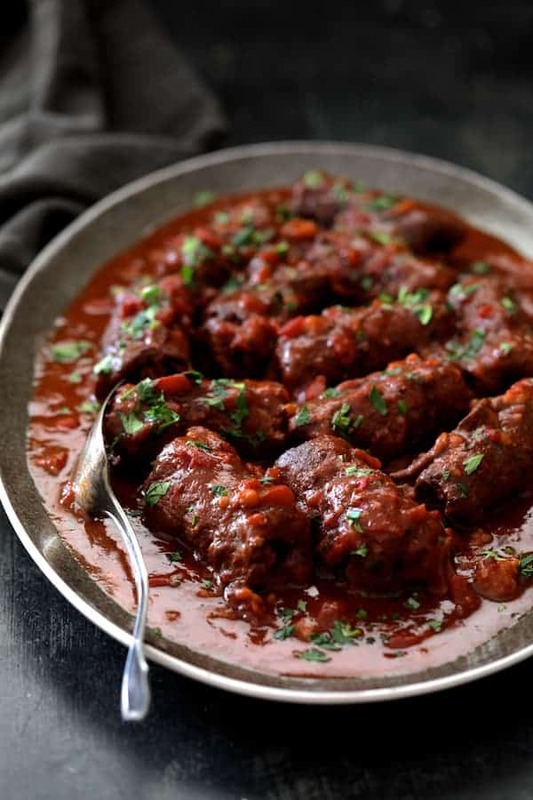 I want a nice sit down dinner kind of kicking off Christmas season and your recipe here for Beef Braciole is calling out to me- think this would be a good choice? what should I serve with it- you listed several pasta choices- if I plate it up for each guest– how do you plate each individual persons plate?- pasta- sauce on it and braciole on top or next to it? how many braciole? just want this to look great and have no doubt it will taste great- I plan to make this weekend to sample and get any tweaks out- do you personally prepare oven or stove top- should I double for 10 women? Advice suggestions etc– It probably sounds like I don’t cook- I do but find I am very detailed oriented lately- old age– ha! Any suggestions etc would be great– maybe I do best when someone tells me exactly what to cook and prepare- the full menu and meal– appreciate your help! Hi, Alice, Thanks so much for getting in touch with me! Well, I think it depends on the women and what they all like. The small rolls may be better suited to a “family-style” meal where everything gets passed. Perhaps you may want to try the other way this dish is made and that’s as one large roll which is then sliced. That way may make a better presentation for individual plating. If you do the individual rolls, I would plan on 2 per person so you would definitely have to double it. I also recently posted a recipe for Pumpkin Soup with Marsala and Mascarpone that might make a good first course. A simple vegetable, some bread and I think you’re good to go! Thanks again and please let me know how it goes. Looks good and i want to try but what does this mean: “Combine minced garlic, parsley, cheese, breadcrumbs, salt and black pepper in a small bowl. Place a prosciutto slice over the filling then sprinkle filling evenly over all beef slices.” When do I place a prosciutto slice over the filling? When it’s in the small bowl? Im guessing I 1) place a prosciutto slice over the filling when it’s in the bowl, 2) then invert the small bowl so I have access to the filling (prosciutto on bottom and filling on top), 3) then sprinkle the filling evenly over meat? What do I then do with the prosciutto slice? Hi, Ned, Good catch! You place the prosciutto slice on the beef, then place filling over the prosciutto and roll. I try very hard, but alas, I’m still only human! Thanks again and I’ve corrected the recipe. Thank you, Beth! I’m in love with this recipe, too! It’s one of my “go-to” recipes for my beef-loving clients. Thanks again, glad you enjoyed and please stay in touch! My mother-in-law made this and was the best I’ve ever tasted. I will try this and see if it is as good. I’ve never made it because I couldn’t find the recipe. So keep posting, I know you probably have so many good dishes. Thanks, Mary Jane! Hope you enjoy! If I want to make this with a whole flank steak what would I have to change in the recipe? Hi, Ruth, Thanks for your question. Really, not that much. I would probably add another type of cheese such as provolone because you’re working with a larger piece of meat and you’ll want that filling to stand out a little more. Hope you enjoy and please let me know how it goes. Thank you! What size of flank steak would you use? This looks entirely too yummy! My husband would love to have this for dinner! Mama Mia is right! This looks mouthwatering and I cannot wait to try it! I pinned it for later! These pictures have me drooling on my keyboard! I can’t wait to try this out myself. I so desperately want to eat this right now! This is one of my favorites, but I always think of it as a special date night type of meal as compared to something I can make for myself. I can’t wait to try this recipe out! Thanks, Mackenzie! Hope you enjoy! This is absolutely stunning! 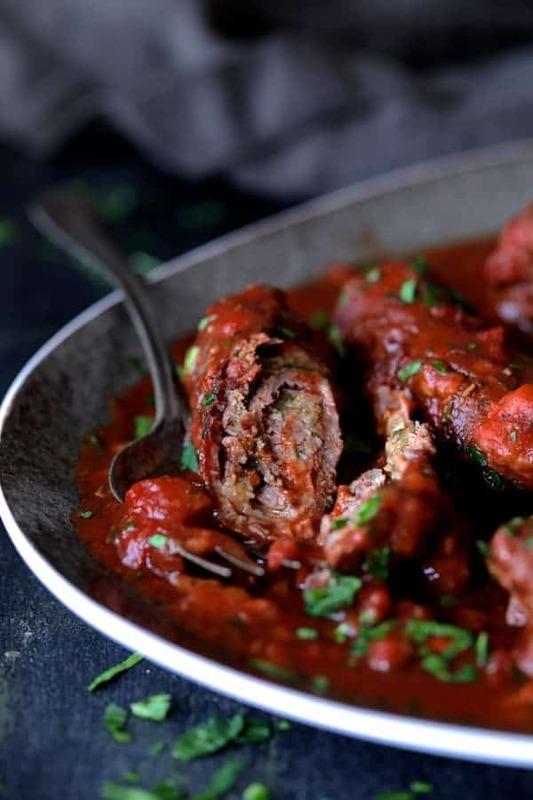 Braciole is a favorite of mine, oh and that sauce looks amazing. I need to make this soon! Thanks, Stacey! Hope you enjoy! This looks absolutely amazing! Stuffed and rolled pinwheel flank steaks are one of my go-to grilling summer dishes, but I’ve never figured out how to bring them inside for the months when our grill is covered with snow. Can’t wait to give this a try! Thank you, Julie! Yes, this dish is adaptable to a whole flank steak too. Hope you enjoy! It looks absolutely absolutely delicious. One of our very family favorites. Your meat and sauce look perfect!! Great job. 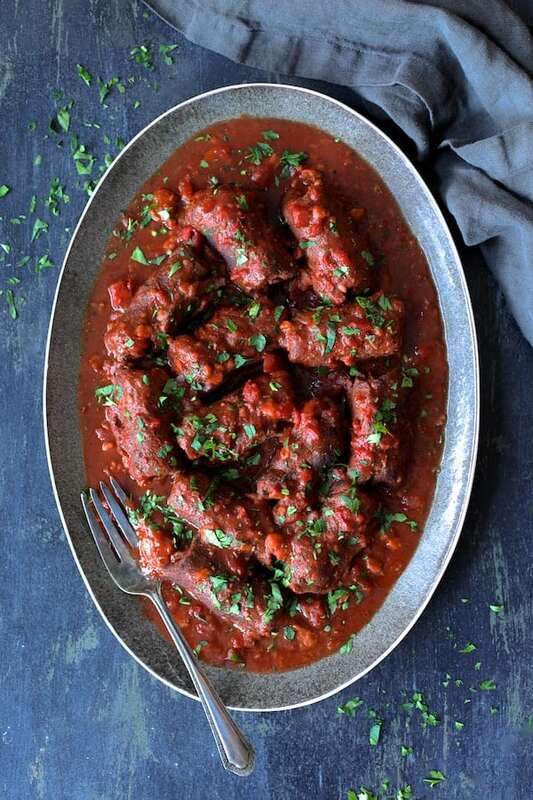 Your version of beef braciole looks great! This is always such a fun dish for those nights when I’m craving a great Italian dish without the extra carbs from pasta. Love the inspiration from the Sopranos too! 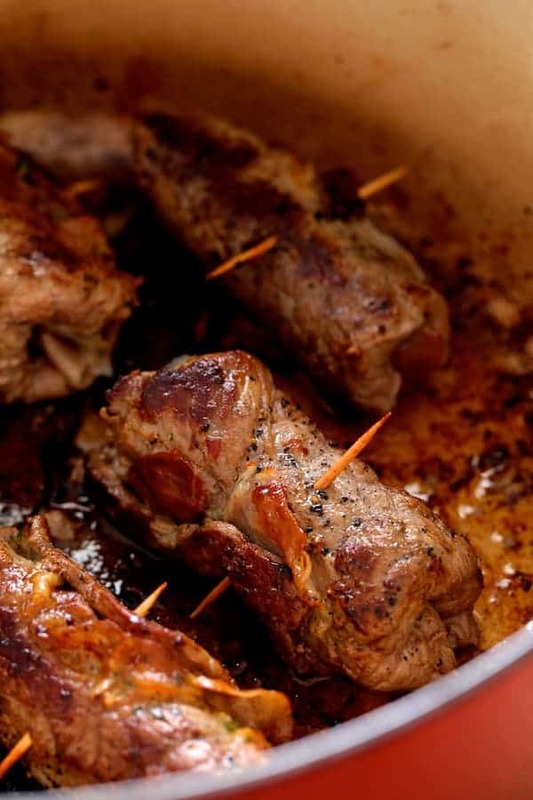 We love a great braciole…. my husbands mother was so good at it that Ive never really tried to make one. But its one of the recipes we never thought to have her write down. Im going to give this one a try and surprise Jeff…. and ps… your photography always makes me hungry! Beautiful! Thanks, Michele! Making the rolls takes a little bit of doing, but the whole dish is soooo worth it! This recipe looks fabulous. It’s a little sophisticated, but is still totally Italian comfort food. I’m going to be trying this one out on my family! Thanks, Rachel! It’s actually pretty rustic but so perfect for guests!